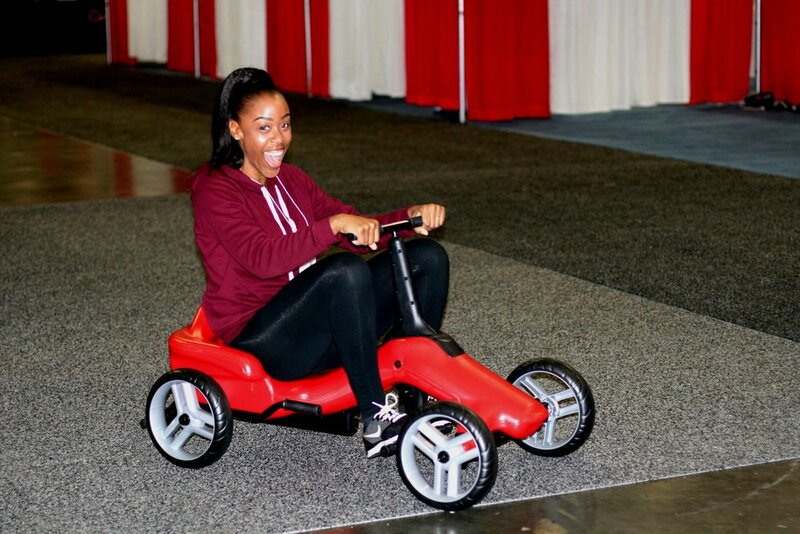 The Pumper Car booth was a hit at this year’s NAEYC conference. Teachers, students, directors and other affiliated conference goers had a blast pumping along! We heard wonderful feedback from too many to name saying “That was a workout!” to “My child would love this!” to “Our school needs a dozen of these!” They were all laughing as they realized the Pumper Car is so much more than just a toy! “The National Association for the Education of Young Children (NAEYC) is a professional membership organization that works to promote high-quality early learning for all young children, birth through age 8, by connecting early childhood practice, policy, and research. We advance a diverse, dynamic early childhood profession and support all who care for, educate, and work on behalf of young children. We were giving away free Pumper Car shirts to anyone who test drove a Pumper Car (even if they couldn't). Everyone loved their shirts and couldn't say enough about what the Pumper Car experience was like. Check out our Instagram page (@pumper_car) for interviews from the conference and more behind the scenes moments from this great event. It's a wonderful time to have a Pumper Car, or buy one for someone you know who may need it! Click on our order now page to get yours today!